My Instagram feed probably gave it away but I was in Belgium last week for work. Sadly, the excitement of the novelty of Belgian food has now worn off for me – it was probably the endless chips, dairy and mayo that did it. Of course, there’s nothing wrong with chips, dairy and mayo but when encountering some combo of the three at almost every meal….well, yeah, I needed a break. On our last night in Leuven, we were, to our relief, brought to an Italian restaurant. I think I’d been expecting an average Italian restaurant, perhaps catering for the cheap-and-cheerful student population, but what I was not expecting was a brilliant Slow Food restaurant. And that’s exactly what Ristorante Rossi is. We had all been booked in for their €35 3-course menu; there’s also a 5-course menu, an a la carte option, and occasional themed menus that reflect one particular region in Italy. The restaurant itself is quite small and quaintly decorated with vintage Italian signs and red and white checked tablecloths. On that Thursday night, the place was packed (Leuven, being a university town, has a busier Thursday night than Friday night. On Fridays, the majority of the students go home.) and buzzing, and the food on the surrounding tables looked excellent. 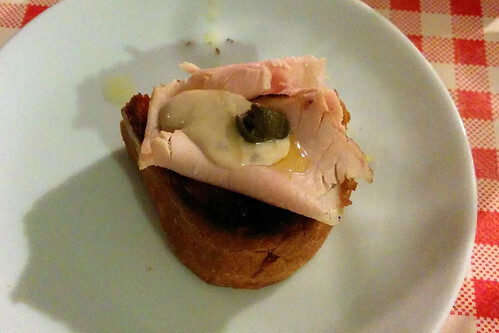 Anyway, first was an amuse of vitello tonnato on crostini. 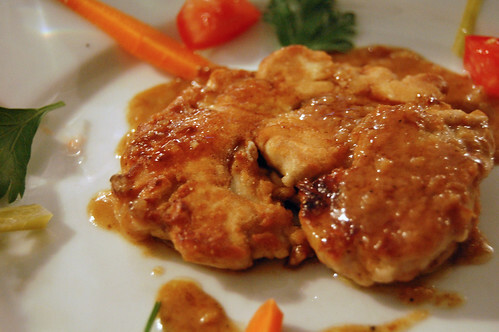 I love that classic combination of creamy tuna sauce with mild and tender veal. 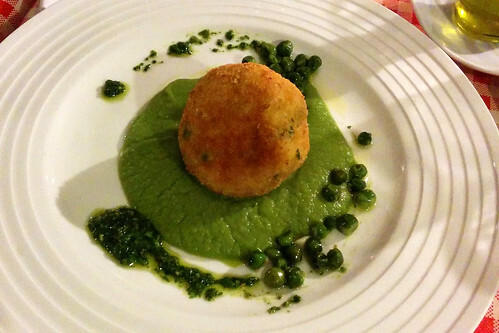 Next was a giant pea and cheese arancino sat on a bed of pea puree, drizzled with pesto. This generously-sized ball of fried risotto (about the size of my fist) went down easily and I may have also helped myself to my friend’s unfinished portion. I clearly had no idea of the size of the next few dishes to come. 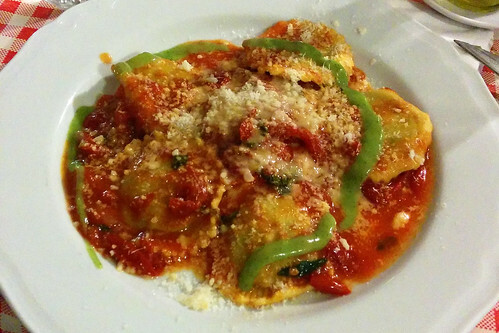 The pasta course was spinach and ricotta ravioli in a fresh tomato sauce with mint. This was fabulous (such an unexpected combination) and I could have gorged on this for my entire meal. But good thing I didn’t. I was again offered my friend’s extra ravioli but I just couldn’t manage anymore, especially when I saw the fish that was to come! Our main course was that fish I saw – I’m not entirely sure of the species but it was a white fish that flaked easily and had been cooked with a delicious crispy skin. 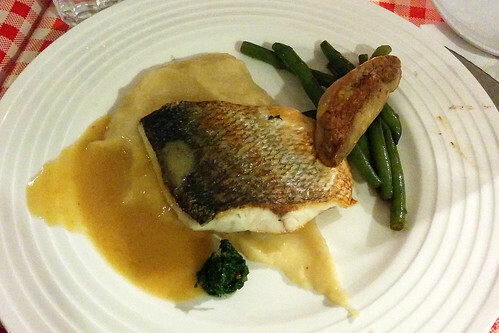 This was served with a celeriac puree, a creamy gravy, green beans and to my utter surprise, seared foie gras! And that little blob of dark green in front? A pesto of parsley and pistachio, from what I could gather – gorgeous stuff. 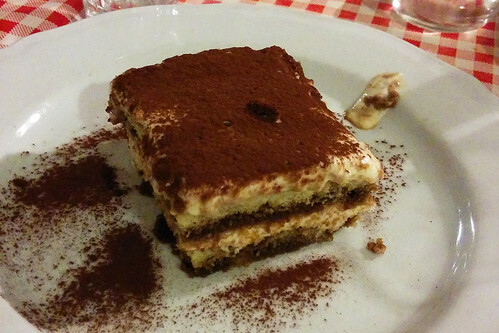 Dessert wasn’t included in the menu and I opted to share a massive serving of tiramisu (€6,50). This was gorgeous, with lots of coffee and quite light, just as I like it. Look at those distinct layers! I forgot to get a photo of the little squares of chocolate cake that came with coffees and the bill – the two layers had been sandwiched together with cream and Nutella! Dreamy! It’s not the cheapest restaurant in Leuven (not sure if the students from the main university go there!) – our meal (with drinks and desserts) worked out to €50 per head. I definitely recommend it and definitely also recommend making a booking before you go. 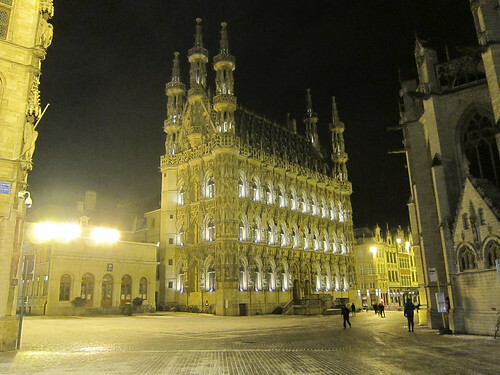 I’ve just returned from a short work trip to Leuven and was utterly charmed by the small university town (of a population of about 100,000, about 40,000 are students). There wasn’t much time for sightseeing but I did have Flemish food for almost all my meals! My trip also coincided with a record breaking snowstorm that dumped at least 20 cm of snow on northern France and Belgium over 2 days, which meant that a few of the project partners could not actually travel in and it was lucky that the rest of us had shown up the evening prior. On my first evening, a Monday, after a delay to my Eurostar train and running to catch the earliest connecting train I could, I was happy to find that some restaurants were still open. I entered the Troubadour not too far from my hotel and was found a comfortable seat. 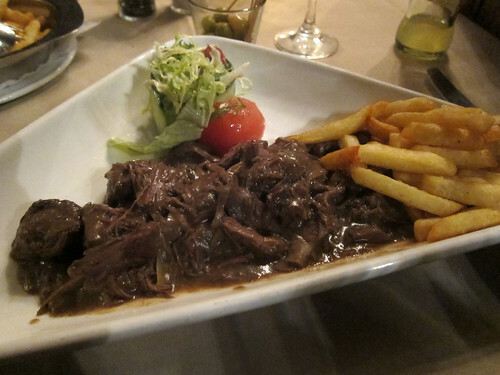 No starter for me, I just needed something to keep me warm – Vlaamse Stoofcarbonade (16,00€) was perfect! That’s a Flemish beef stew cooked with beer and brown sugar. And the hand cut Belgian fritjes (fries) that accompanied it – oh, the beautiful sound they made as the waiter scooped up a few to place on my plate. Wow. It’s not a bad place to stop for proper Belgian and Flemish classics. It’s not the cheapest place but it’s certainly reliable. After dinner, I wandered around the centre a bit but had to give up after a while as it was getting colder and it was getting dangerously icy. The town is beautiful though and felt very safe with lots of students still up and about. Yeah, not very light it was overnight. I was very cold and underdressed and now I’ve got a cold to show for it. That night, we all went to Domus, a small brewery with its own restaurant/pub. Now this place was full of students as prices are relatively low. 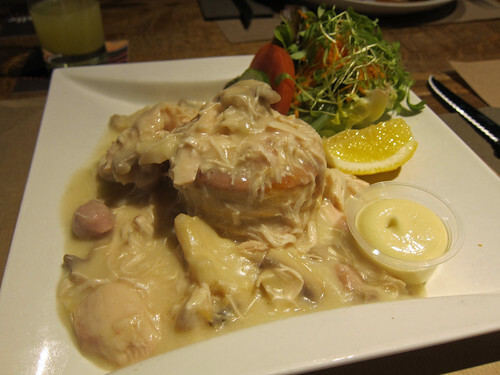 My Koninginnehapje (11,50€) was another Flemish classic – a creamy chicken and mushroom stew served in a puff pastry vol-au-vent. You get your choice of side dish to go with this – there are at least 4 potato preparations on offer in addition to pasta or rice. I had potato croquettes though I’m positive they were fried from frozen. Portions are huge here and this certainly filled me up. Desserts are pretty grim so I’d give them a miss (my speculoos ice cream was terrible). Don’t expect anything fancy – the food is very basic but the beers are good, I hear. Apart from these two main meals, there was a lunch at a student mensa (not bad and quite cheap) and a catered lunch with a fantastic chocolate mousse. 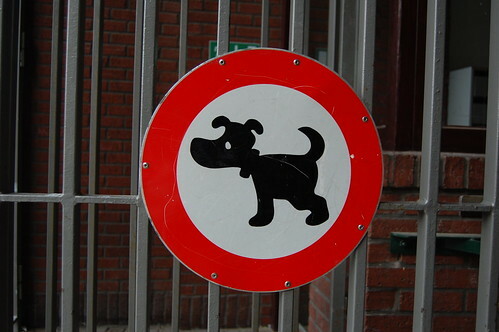 Only in Belgium! My hotel warrants a mention as well. 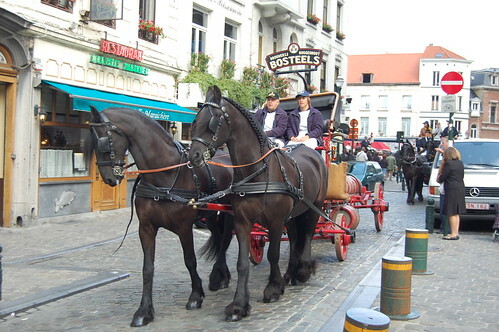 Hotel de Pastorij is a small 7-room guesthouse located right in the centre of Leuven. Rooms are generously sized and very comfortably furnished but what’s best is the fabulous breakfast buffet in the morning. 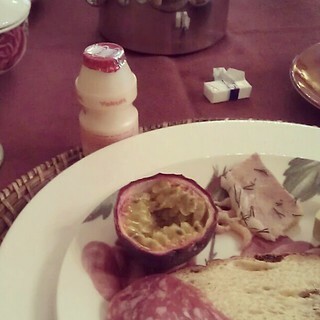 There’s Yakult! And passion fruit (maybe not all the time)! And lots of other very very good things. The weather cleared by the end of my trip and I was able to catch my train (delayed) home. If I had been stuck though, I would certainly have stayed again at this hotel. 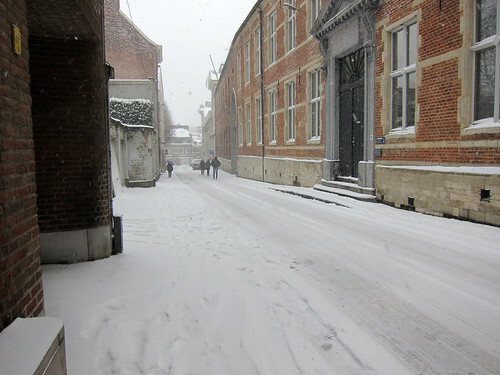 I’d recommend a visit to Leuven – it’s only a short train ride from Brussels and would make a lovely day trip out. All the photos from my short trip can be found in this Flickr photoset. As my Brussels post was becoming a bit epic, I decided to post the take home goodies separately. A number of well known Belgian food shops are located in and around the Place du Sablon and I decided to hit up the ones that were particular to Brussels. Neuhaus, Godiva and Cote D’Or chocolates can all be purchased in London so those were all missed (I’m not a fan of Godiva myself). That left Wittamer, Pierre Marcolini and Dandoy. I started at Wittamer and chose 250g of chocolates at about €12. 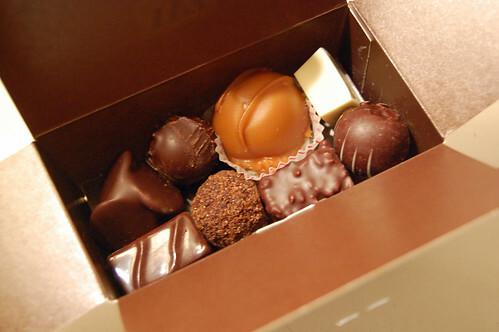 I was quite taken with the fresh cream chocolates – huge, slightly chewy and uh…creamy. That big, tan coloured praline on top was a fresh cream coffee chocolate. However, I was greatly disappointed by a pineapple praline whose description was better than its execution. … and a length of vanilla marshmallow. It’s hard not to compare the products of the two chocolatiers. 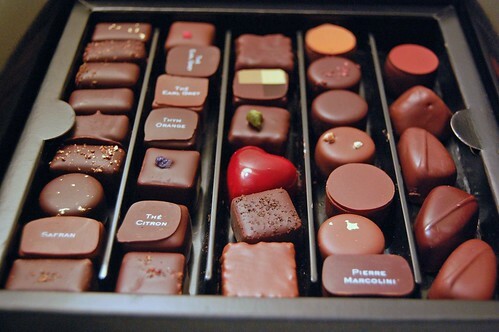 At €17 for the Pierre Marcolini box (about €70 per kilo), this was more expensive than the Wittamer chocolates. If the little jewel-like chocolates are that pretty girl you have your eye on, the Wittamer chocs are her thug of a brother who won’t let you near her. 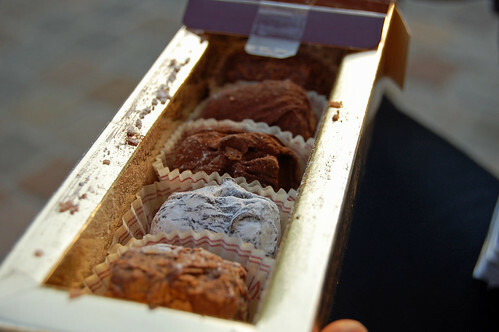 While delicious, the Wittamer chocs lacked the Marcolini refinement and their flavours were more muted. 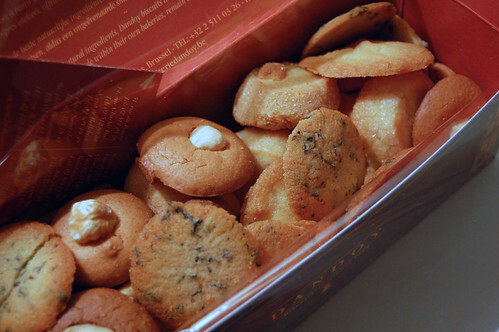 Of the Marcolini chocolates, the pink peppercorn, safron, the Pierre Marcolini Grand Cru and those with crunchy Quimper wafer were particularly memorable while the mango one was the most disappointing. Notice the trend? Perhaps tropical flavours shouldn’t be attempted. 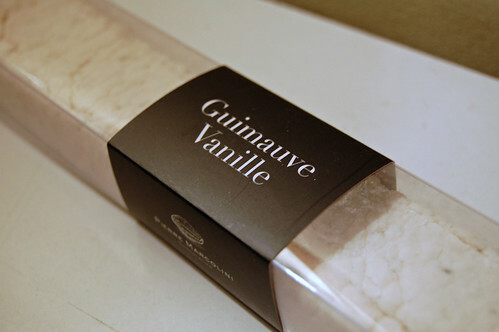 I had to buy the marshmallow after seeing this image on the Marcolini website – it’s so light and fluffy and is probably the best marshmallow I’ve ever had. I’m spoiled for life. 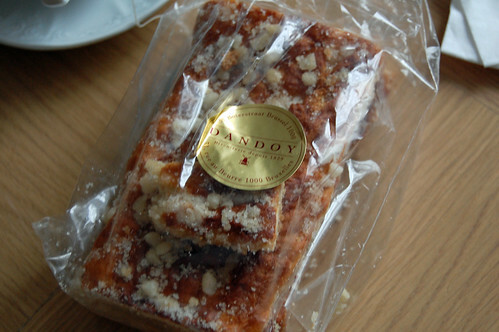 I ended with Dandoy, the Brussels-based biscuiterie. Here I bought 300g (about €11) of a selection of their biscuits, my favourites being Patience (a chewy almond macaroon with a hazelnut on top), Earl Grey (a butter biscuit scented with Earl Grey tea) and Chocolate Perlé (a shortbread with bits of chocolate and hazelnut). They have gorgeous biscuits and an equally gorgeous pain à la grecque (also in my previous post). There are definitely other excellent food shops in Brussels but those were left out due to a lack of time. Good thing there’s a cluster of them in the Place du Sablon! 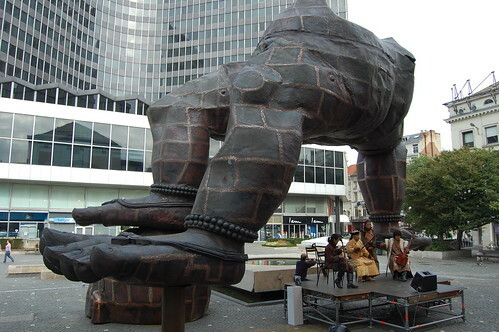 The reason behind all this publicity is a new advertising campaign called Little Break, Big Difference that encourages people to try out a short journey to the continent – the Little Food Break was a day out in Lille. Initially, it seems ridiculous to go for just a day but when you realise that from London, it’s about 2.5 hours to Paris, 1.5 hours to Lille, and about 2 hours to Brussels, then a day trip is certainly doable! They’re encouraging a few themes to the trips. I’ve since learned that they’ve been conducting Little Breaks for various interests; apart from the Little Food Break to Lille, there was also a Little Art Break to Brussels, a Little Fashion Break to Paris, and a Little Music Break to Rock en Seine. Back to the trip! I requested overnight return tickets as I was very keen to see as much of Brussels as possible, this being our first time there. Upon hopping onto our 8am train, we were surprised to see that they gave us Leisure Select tickets, entitling us to a meal, a spacious seat and lots of reading material. All these little extras made the two hours zoom by and before we knew it, we were in Brussels. We arrived at 11am local time and hit the pavements almost immediately; we planned on walking all over the city! Luckily, we discovered that Brussels is indeed a very walkable city: mostly flat but with a few small hills and its old centre is quite compact. What struck me almost immediately was the city’s gentle nod to its bande desinée (comic book) history, what with the comic strip walls and the cartoony street signs. 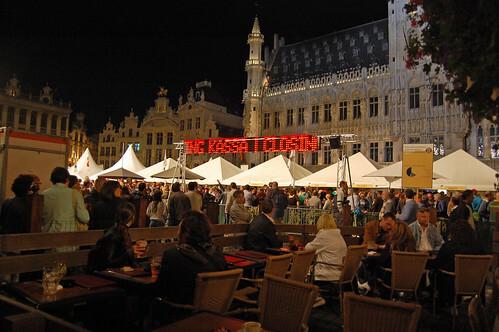 We made it to the historic and touristy centre and the Grand Place (Grote Markt in Dutch), where a beer festival was going on – shame we’re not big drinkers! It looked like each stand was dedicated to a particular Belgian brewery and the square was already packed so early in the day. We moved away from this area and towards the Eglise de Saint Catherine in a quieter but equally pretty area that’s much less touristy. As we were just about to walk into the church, we heard the sounds of a marching band and ran out in time to see not just the band but a whole parade full of horses and carriages, one set for one brewery! This must’ve been tied to that beer festival! We did eventually go into the church, which had statues along the main aisle, something we’ve never seen before. As someone filled up at breakfast on the train (which, to be fair, was much nicer than most offerings on airplanes), we opted for a light lunch of a sandwich and Belgian fries. 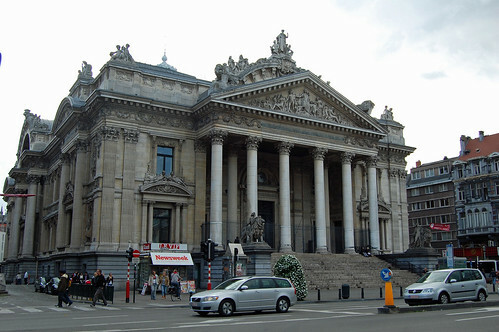 We purchased a serving at Fritland next to the Bourse and sat on the steps while munching on them, amused by the antics of a school group consisting mostly of Goths. 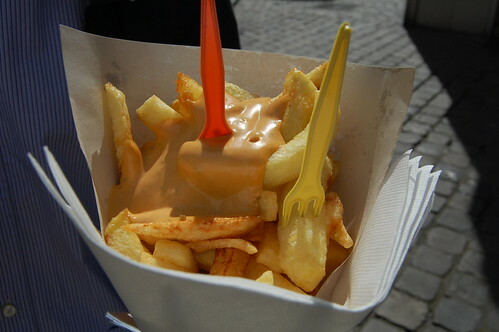 These thick cut chips were mighty tasty with a big dollop of sauce andalouse, a typical Belgian mayonnaise based sauce that’s ever so slightly spicy. After a visit to the cathedral (again with the statues on the columns and also a wonderfully ornate pulpit), we wandered over to our hotel for the night to check in (I found a great deal online). And I had a nap. Yeah, the early start got to us and we needed a bit of a refresher; that’s the nice thing about spending a night – the opportunity to take it easy. After the brief respite, we went out again and wandered through les Galeries Royales Saint-Hubert, the oldest shopping arcade in Europe, picking up a few chocolate truffles along the way. And so we continued, passing a pleasant afternoon by wandering the streets of Brussels, swinging by to see the Manneken Pis, visiting a number of churches and uh…munching on those chocolate truffles. Soon, it was dinner time and we made our way to Viva M’Boma, where we had a reservation for that night (with the help of the nice concierge man at our hotel). This booking was essential; a few parties were turned away as they didn’t have one. This modern restaurant with its almost clinical looking white tiled walls serves very traditional Belgian dishes – exactly what I wanted to try while I was here – and I’d first heard about it here at On (Glorious) Food and Wine (you might like to know that the service seems to have improved since then!). To start, Blai and I split brains (again!) meunière, which they even split for us onto two plates. My second brain dish was possibly even more delicious than my first, with the edges crispy and the sauce meunière and the gently pickled vegetables complimenting the richness of the organ. To follow, we chose some very traditional dishes – for Blai, stoemp of the day with bacon and sausages. 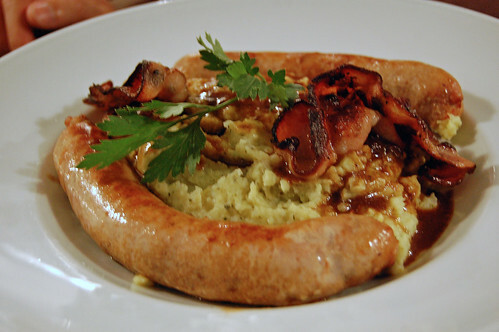 A mountain of stoemp, a potato mash with the addition of a vegetable, arrived along with two massive fresh sausages and crispy fragrant bacon. He adored this; he must have mentioned that these were the best sausages he’d had in ages at least ten times during the meal. For me, I had the waterzooi with chicken. Ever since I was introduced to the word in a French class ages ago (we were reading some passage about Belgium, I think), I’ve been fascinated by waterzooi and on trying it. Here was my chance! 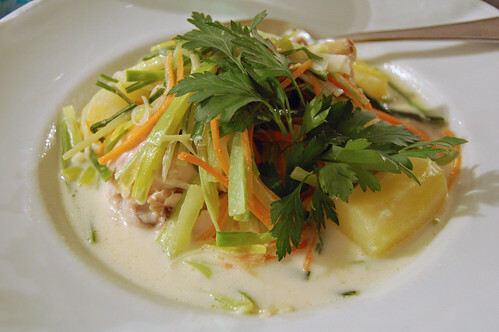 What showed up was a light stew of chicken (half of one) with vegetables – the broth opaque with the addition of egg and cream. It was brilliant for a summer night, the gentle flavour of the dish tricking you into thinking that you’re eating quite lightly. Though we were now both pretty full, we pressed onwards to dessert; and with no regrets too – they were both fabulous! 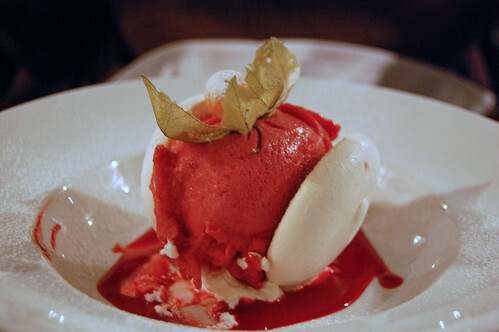 Blai had a baiser de vierge (kiss of the virgin…or uh, something much ruder if you get Google to translate it), which was two crisp meringues sandwiching a big scoop of raspberry sorbet. 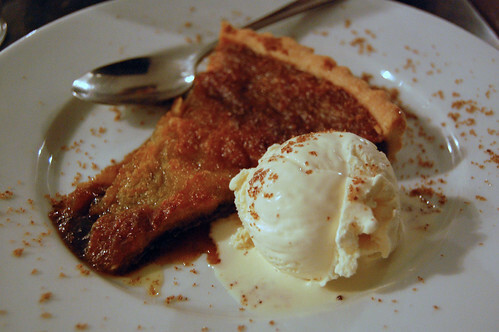 I chose the tarte au sucre, also very typical of Belgium, which came with a scoop of beautiful vanilla ice cream. As you can imagine of a pie that’s filled with sugar, it was sweet but incredibly moreish. I found space for the whole thing. We rolled out of there after parting with just €50 (we didn’t have wine), passed through the Grand Place at night (now full of the sounds of breaking glass) and headed back to the hotel for some more sleep. The next morning, we had a nice lie in, hot showers and a breakfast of tea and pain à la grecque from Dandoy, purchased the day before. This sweet, chewy yet crisp bread has a heavy scattering of big sugar crystals, making it more like a biscuit than a bread – delicious. After checking out, we wandered round to see the Opera building, where surprise! there was a little outdoor concert that morning featuring Mongolian musicians and a throat singer. If you’ve not heard this before, it’s quite special – the voice is controlled in such a way that two lines can be heard at once – one lower (the fundamental frequency) and the other much higher (made up of harmonics), which carries a melody. This was my first time hearing it in person – I’d only seen some amazing examples on YouTube! 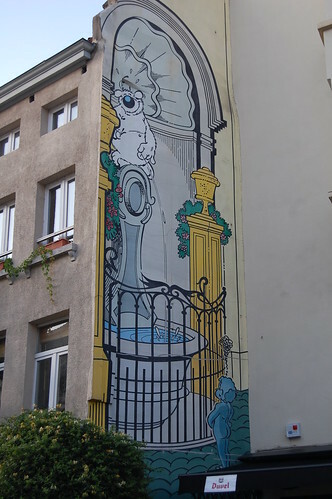 After some time at the concert and a quick glance at the Jeanneke Pis, we strolled down to see the Marché du Midi, next to the Gare du Midi (which houses the Eurostar terminus). 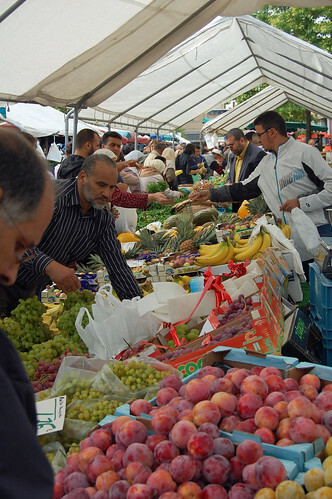 Now this was a proper market! 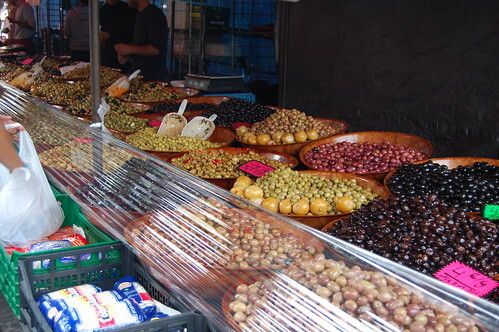 Row upon row of beautiful fresh produce, fish, grilled meats, tubs of olives sat alongside the other usual market purveyors (think underwear, wallets and other miscellany); luckily there were enough food stands to keep any keen foodie busy. Unfortunately, we didn’t have enough time to join the queue for a Moroccan flatbread with olives, cheese and honey, as so well described on Orangette. 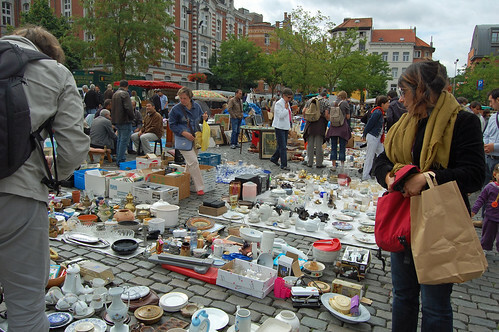 Not just food markets abound but also flea markets – such as this one we passed not far from the Marché du Midi. I admired a brightly painted patio set before remembering that (a) I was not in London and (b) even if I had been, we don’t have a patio/balcony. We couldn’t stay long, however, as it was lunchtime and we hastened to Les Brassins, located nearby to the Avenue Louise, a posh shopping street (not that we did much shopping – most shops are closed on Sundays). I understand that it’s a popular place but the restaurant was very quiet that day and seemed even quieter still as the solitary restaurant/bar on the street. 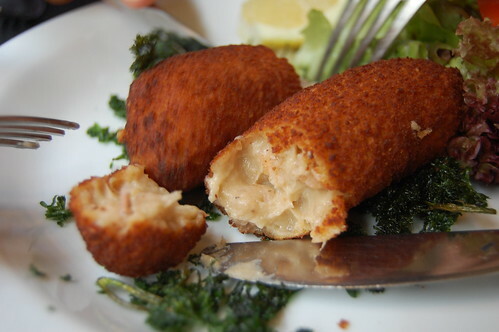 From the specials menu, we first split an order of the croquettes aux crevettes (shrimp croquettes). These creamy bechamel based croquettes were filled with plenty of little brown shrimp (as you mentioned, Catherine!) and fried to a brown crispness. That’s a filling I’m going to have to try at home! 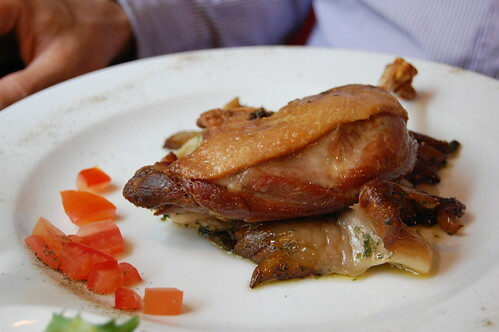 Blai had the duck leg confit with pleurotes. We had no idea what pleurotes were but they turned out to be lovely big oyster mushrooms, quite an unusual accompaniment to duck confit, no? On the side were a dishful of freshly fried frites. 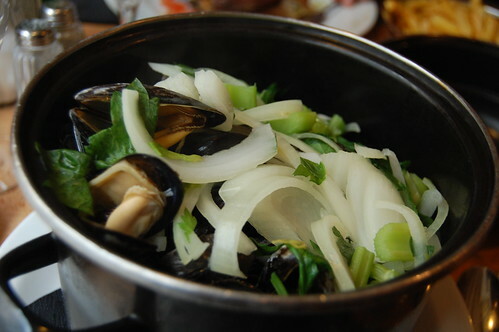 I chose the moules marinieres (mussels in Brussels!) and a huge potful scented with onion, celery and flat leaf parsley was brought to me along with a side dish of frites. It took some time for me to work my way through them all but I persevered. All delicious though a few were a bit gritty. We finished the meal with “lighter” desserts of speculoos ice cream (me) and pear and lime sorbets (him). It’s probably best that I don’t have an ice cream machine at home… I can imagine my girth growing totally out of control. Conscientious that time was ticking by, we walked with full bellies towards les Musées royaux des Beaux-Arts de Belgique where we looked at both the Ancient Art and Modern Art collections until they threw us out at about 6pm. 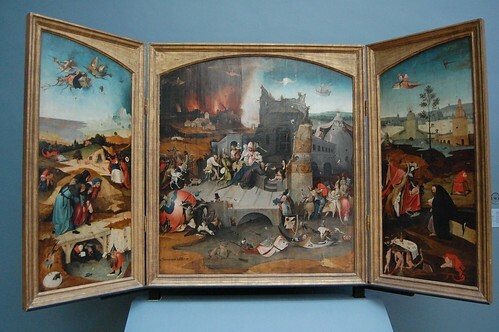 It was definitely time well spent – we thoroughly enjoyed their collection of Flemish art and I was thrilled to see a painting by Hieronymus Bosch and some wonderful pieces by Pieter Brueghel (both elder and younger). There was enough time after the museum closed and before our train for me to get some goodies to take home. Wittamer, Dandoy, Pierre Marcolini – but I think this post is long enough so I’ll dedicate another post to what I bought! And still after all that shopping there was time and we found ourselves sat at the Wittamer cafe with a cappuccino, a hot chocolate and a waffle with cherries, ice cream and crème Chantilly. 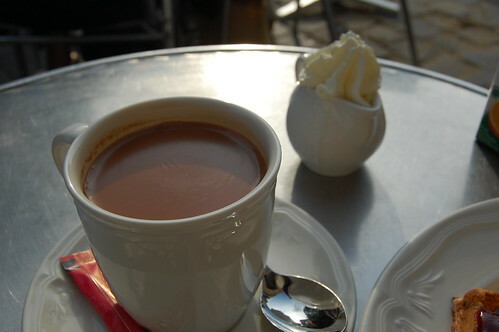 I was terribly disappointed with the hot chocolate – it being a very milky and powdery version rather than a thick, rich French-style one I was expecting. Oh well. Thankfully the waffle was delicious. And so ended our lovely little break in Brussels. We strolled back over to the Gare du Midi, now laden down with various shopping bags, and sat in a cafe outside waiting to check in. 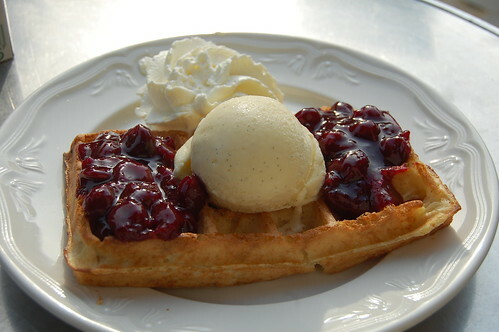 I bought another waffle for the trip – this time a thick, yeasty and sweet gaufre de Liège – and we soon boarded our Eurostar train. Another meal, another nap and we were back in London. 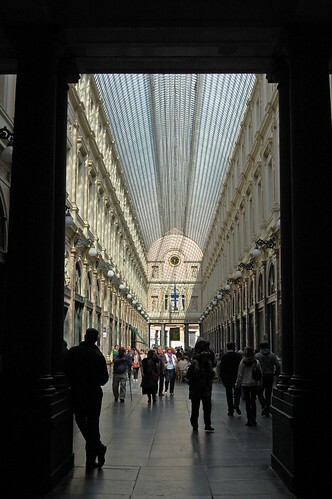 All the photos from our Little Break to Brussels can be seen in this Flickr photoset. Thank you very much, Eurostar and We Are Social!